Venus Beauty did it again.. and more!! Well, there isn't a product review today as this post clearly demonstrates.. or maybe showed that. But don't worry! I'm using today's slot to introduce this brand called Venus Beauty to all my beautiful lovelies out there. 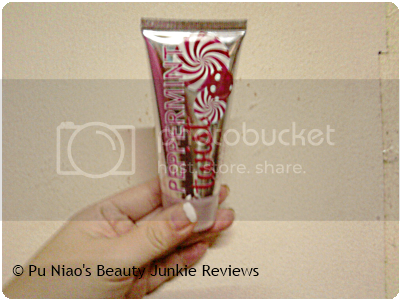 If you are a constant reader to my blog, you would have remembered this particular (latest) blog post that touches on Venus Beauty giveaway at http://puniaogoodies.blogspot.sg/2012/09/samples-receivedredeemed-12-sept-20.html. So for today, I'm sort of "showcasing", meh, make that introducing Venus Beauty's latest giveaway for being their fan(s) on their Facebook page @ https://www.facebook.com/venusbeauty.sg. But before you get too excited, read this carefully first! 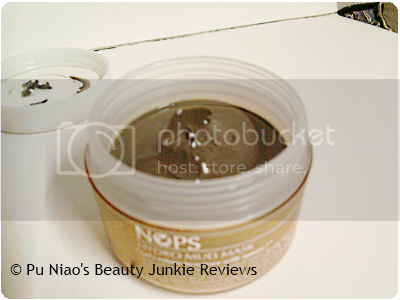 This NOPS Hydro Mud Mask that I got to redeemed this time round is a retail-sized version, not a sample!! It weighs 80g and the retail price is (rough estimate) SGD $19-ish. My apologies as I didn't see the actual product being put up for sale. Probably because the giveaway is for fans and once the giveaway is over, then they'll start selling it for real for fans who love it and decided to buy the product for long-term use. Here's how the product looks like without the box/packaging. Allow me to remind you once more, this is a retail-sized version, not a sample product. Want to get your hands on free giveaways from Venus Beauty? It's not that hard actually. Find your way over to Venus Beauty Facebook page (Singapore) at https://www.facebook.com/venusbeauty.sg, Like their page. For latest exising fans and Likes, you'll have to wait for the next giveaway, but I assure you the wait is worth waiting for. Currently, this is the 3rd giveaway I am getting from Venus Beauty without even paying a single cent for it. Maybe the transport money, but it's definitely worth your transport money to get it. This time around, Venus FB Fans gets to redeem a tub of NOPS HYDRO MUD MASK (worth $39.90) with your NOPS Egg White Bubble Cleanser's EMPTY BOX! Check out our terms & conditions below! 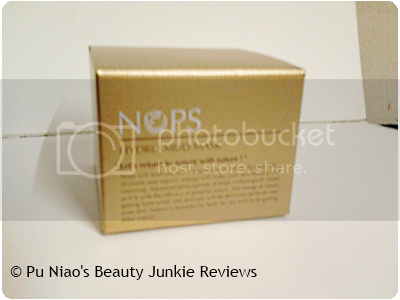 If you have a NOPS Egg White Bubble Cleanser box (carton silver box not the plastic container), regardless you buy or redeem it from the previous giveaway, bring the box to Venus Beauty Ang Mo Kio to redeem for a tub of NOPS Hydro Mud Mask! Just need the box! 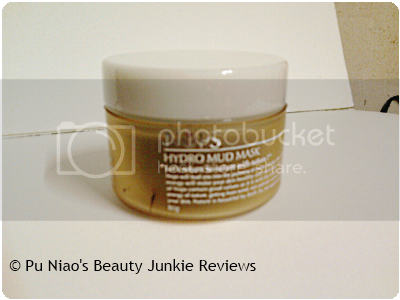 3) Redeem the NOPS HYDRO MUD MASK. Redemption is only available at Venus Ang Mo Kio. Redemption period is from 2 October 2012 - 16 October 2012 or while stocks lasts. Failure to comply to our terms and conditions (it's not that hard, is it?) will result in immediate disqualification. No box, not at AMK, no mask. What are you waiting for? Go be the newest FB fan on Venus Beauty Facebook page (Singapore) at https://www.facebook.com/venusbeauty.sg in order to be notified of the next giveaway. I'm already feeling excited for the 4th giveway now!! Can't wait!! And for the next item from Venus Beauty, I bought these trio baby for SGD$8.90 only. They do have bigger tubes, but then it's the first time I'm buying Body Lotions from Venus Beauty. 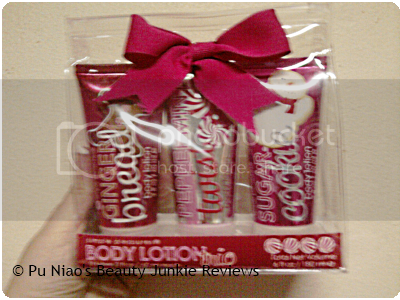 The bigger individual tubes are roughly SGD$18.90 or SGD$19.90 each and there are 3 flavours in all. Comes in 3 uber delicious flavors for an affordable low price of SGD$8.90 only. Perfect either for yourself or even as a Christmas gift, I'd dare say!! 1. Kindly avoid promotional/non-sense/unrelated comments or demands as this can be reason for deletion of your comments. 2. Avoid commenting with "nice post"/"thanks for sharing", or the likes. Kindly just read the post and comment something about it. 3. Replying with some facts/rumors or other info related to the post is well appreciated too.